Thinking about bringing your cat along for the ride on a trip this summer? If so, it’s a good idea to prepare your cat by taking them on shorter car rides in the weeks leading up to your trip. Check out a few more ways to make traveling easier on your cat below! Invest in a car carrier. Under no circumstances should your cat ride in your car without a carrier. If your cat is loose in your car, it could be seriously injured in the event of an accident or cause dangerous distractions while you’re driving. 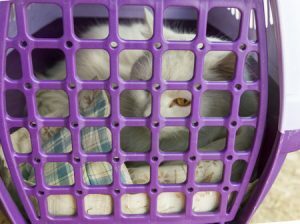 A carrier will keep your cat comfortable on long car rides and prevent them from putting you and your fellow travelers in harm’s way. Make your cat feel a little more at home in the car by bringing their favorite bedding and toys along with you on your trip. Cats are creatures of habit, and these items can make their carrier seem like a safe, familiar sanctuary while you’re on the road. Take breaks on a regular basis. You might be tempted to get to your destination as quickly as possible when you’re traveling with a cat, but it’s typically best to take a break every few hours instead. This will help keep your cat calm and give them an opportunity to have a snack and use their litterbox. You can let them out of their carrier to stretch their legs, but be wary of letting them out of the car at busy rest stops and make sure they’re always wearing a collar with an ID tag. Want to make sure your cat is comfortable on your next journey? The beds and pillows from the Cat’s Inn have been carefully designed with our feline friends in mind. Give us a call at (877) 228-7466 to learn more or place your order today!